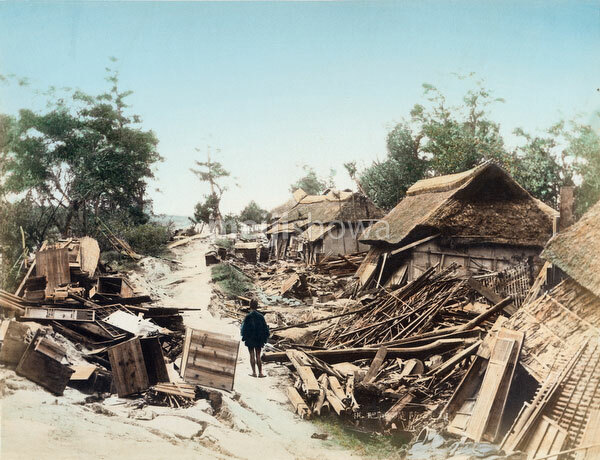 Devastation in Ichinomiya (一の宮村) in Aichi Prefecture caused by the Nobi Earthquake (濃尾地震, Nobi Jishin) of October 28, 1891 (Meiji 24). Debris is piled up along a cracked road. The Nobi Earthquake measured between 8.0 and 8.4 on the scale of Richter and caused 7,273 deaths, 17,175 casualties and the destruction of 142,177 homes. It is the largest recorded quake in inland Japan. It jumpstarted the study of seismology in Japan and proved that earthquakes are caused by fault lines. The quake is also referred to as the Mino-Owari Earthquake (美濃尾張地震, Mino-Owari Jishin).